Today is a bittersweet day today. We are wishing our good friend, Mynn Kitchen well, as she dedicates herself to her teaching -- something she has found that she really, truly loves. How blessed she and her students are for that! It's bittersweet, though, because it's also my last post for the MHKDesigns team. I've so enjoyed being on this team for nearly 2 years now, and working with the fabulous images and papers that Mynn provides, plus working under her loving leadership and guidance. She has been a true friend to me while I've been on this team. It's the first of the month which would usually mean it's time for a new challenge at MHKDesigns, and also for a new set release. But sadly, Mynn, the very talented owner of MHKDesigns and card creating genius, has made the very tough decision to close the blog (the Etsy store will remain open for the time being at least, but nothing new will be added to it) to focus on what's important to her, her life as a teacher. Instead of the usual first of the month post, we are having this thank you blog hop for Mynn Kitchen. Julie -- You are here! This first card was colored with Faber-Castell Polychromos pencils. 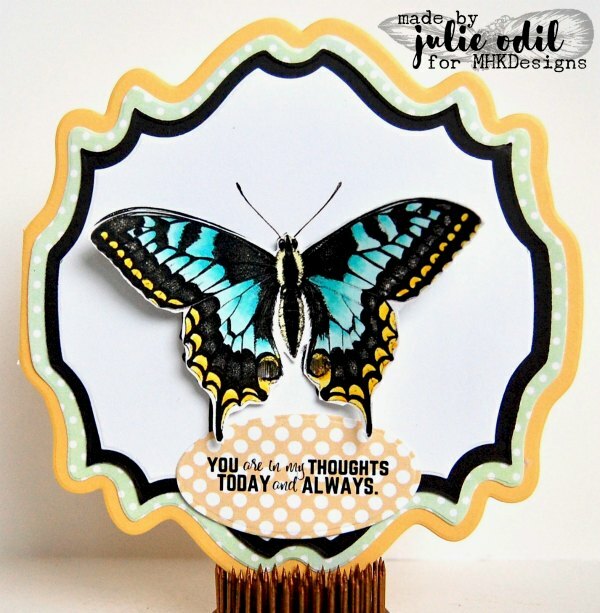 This 2nd card uses the sentiment from Majestic Medallions, and the butterfly from Butterfly Wisdom. I colored the butterfly twice, fussy cut it once, and used foam tape to give it some dimension. The designer papers on both cards are also from MHKDesigns, and were printed on my laser printer. That's it for me. Now, hop on to the lovely Dawn's blog and see her beautiful creation! Your coloring is beautiful! Great cards! Both of your cards are gorgeous. Lovely cards and great ideas, it has been a pleasure working with you at MHK Designs, take care.